First Name Last Name Email UO users - please register with your uoregon.edu email address I understand and agree with the ObaVerse Terms & ConditionsTerms & Conditions. ObaVerse is a powerful learning management system (LMS) that encourages novel applications of learning at the intersection of community, knowledge and sharing. Sound complex? Not at all. Heck, we'll even help you get there. Outside the box? Check. Innovative? Check. You dream it, we'll make it happen. No app install. No tech torment. ObaVerse works on your device, right now. Construct courses for all learners. At their pace, at their level. Google Drive, Evernote, Wikimedia, oh my. Demonstrate mastery of your subject, or just share pictures of cats. API. LTI. SSO. LDAP. ICAL. RSS. FAQ. DIY. GR8. LOL. Where did ObaVerse come from? ObaVerse is built on 15 years of educational technology research conducted by Dr. Yong Zhao and a development team consisting of educators, designers, and coders here in the office Global and Online education at the College of Education at the University of Oregon. 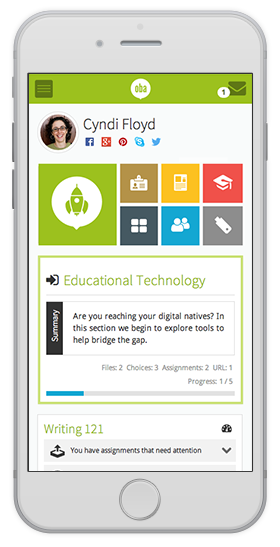 ObaVerse provides a high-quality learning management system (LMS), a digital solution that is constantly evolving to meet the needs of learners and educators. Our commitment is not to any specific set of technologies or products, but to providing the most appropriate tools for learning and instruction. We work with thousands of teachers and students from all over the world. How are people currently using ObaVerse? Thank you for the awesome platform you and your team created and maintain. Our first 3-hour training session had such great reviews - our teachers are truly excited about Oba. Training participants were "blown away" with ease of the virtual classroom and voice recording features. It is so easy to navigate - I love the way that the week’s schedule, including all readings, topics, and assignments, is pulled straight from the syllabus and put on the front page. You have no idea how much stress you are saving me! Relevant and fun - Oba has given us a way to take the teaching out of the classroom and into our students’ world. It shifts teaching and learning to a social media setting that encourages collaboration and participation. Just what I have been looking for - Oba has inspired me, the more I learn about it the more motivated I am to build effective and dynamic courses for my students and colleagues! Looking for K12? visit ObaWorld!